Antalya : Prime Minister Narendra Modi expressed his views using strong words and reached out to the global world leaders using G 20 summit and BRICS platform as a medium to re-emphasize the urgency of fight against terrorism. United together, terrorism can be fought with grit and determination, indicated PM Modi, while joining world leaders in calling for joint action against terrorism. PM Modi on Sunday brought attention into defining steps which could result in containing fund flow towards terrorist funding by choking financing facilitation. He also spoke about steps which must be immediately taken in snapping supply of arms and communication channels of terrorists, for which an enhanced effort towards global cooperation would be urgently required which could check use of cyber networks by militant groups. Strongly condemning Friday’s terror attacks in Paris, Modi, at a meeting of the BRICS leaders on the sideline of the G20 Summit here, made a case for united global effort to combat the menace of terrorism. He said – We stand united in strongly condemning the dreadful acts of terrorism in Paris. The entire humanity must stand together as one against terrorism. The need for a united global effort to combat terrorism has never been more urgent. Combating terrorism must also be a priority for BRICS nations. We express deepest sympathy and support to Russia for the loss of life in Sinai. Ankara and Beirut are also reminders of terror’s growing spread and impact. Speaking on a global strategy towards terror attacks, PM Modi said that counter-terrorism should become an important aspect of the BRICS countries’ work. He said, the scourge of terrorism is growing, and all humankind should unite to fight it. This must be a priority for BRICS countries as well. Leaders of other BRICS nations too joined PM Modi in the fight against terror and condemned terror attacks in strong words. Modi said G20 should promote stronger global action to address security challenges, and the route for achieving this should filter through taking decisive steps to stop the flow of arms and explosives to terrorist groups, create special international legal regime to disrupt terrorist activities. In his exact words — The G20 should cooperate in preventing the use of cyber networks by terrorist groups and adopt at an early stage Comprehensive Convention on International Terrorism. The meeting(this session) is being held under “the tragic shadow of dreadful acts of terrorism” and leaders are “united by a sense shock, pain and outrage.We are united in condemning the barbaric attacks in Paris this week; and, the recent bombings in Ankara and Lebanon. We share the sorrow of Russia for the lost lives in the fallen aircraft in Sinai. These alone are a stark reminder of the dark force we face– larger than specific groups and particular targets and territories. Terror is a major global challenge. It not only takes a tragic toll of lives, it also extracts a huge economic cost and threatens our way of life. It calls for a comprehensive global response. Combating it must be major priority for G20. 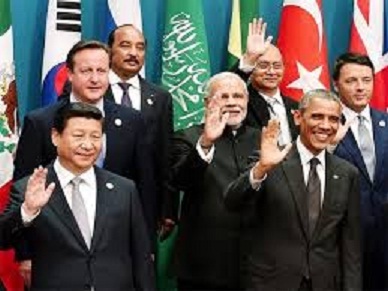 Several leaders including US President Barack Obama, Russian President Vladimir Putin, Chinese President Xi Jinping condemned the Paris terror strikes and joined voices in discussing ways to tackle terrorism and contain the channels of terror financing. The leaders of 20 large economies today observed a minute’s silence for the victims of the deplorable terrorist attacks in Paris. The killing of 129 persons in Paris terror attacks linked to the Islamic State ahead of the G20 Summit reflected strongly on BRICS and G 20 summit and put pressure on global leaders to enhance cooperation in their fight against terrorism.